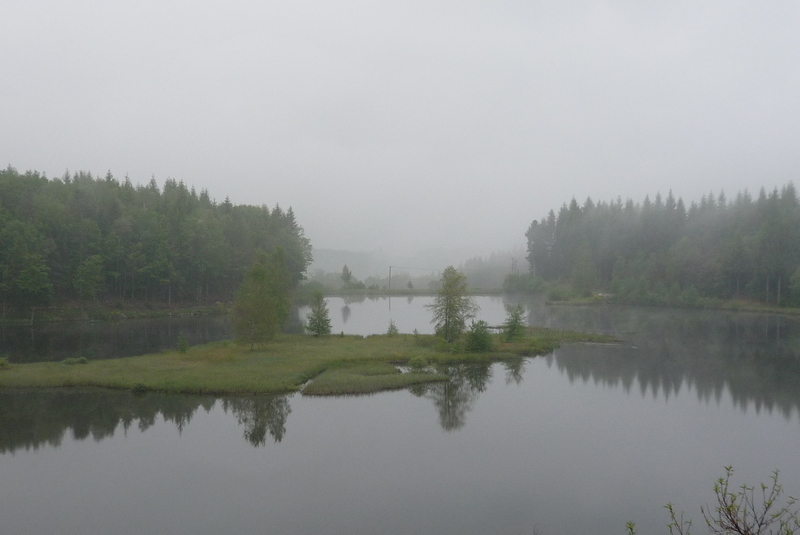 After an amazing night of deep, silent sleep (except for the rowdy frogs in the lake), the morning looked questionable. Luckily it was only fog and as fog does, it burned off. By the time we reached our starting point it was promising to be another surprisingly beautiful day. 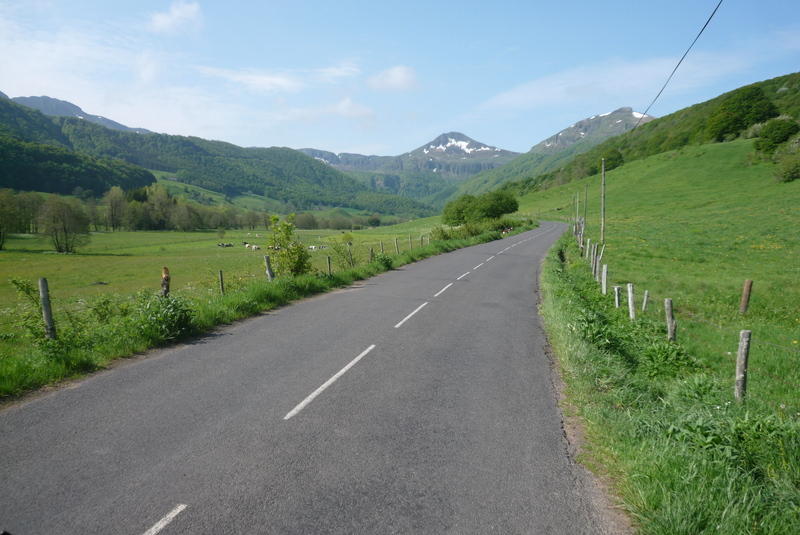 The big objective for the day was the climb of Pas de Peyrol (or Puy Mary, if you like), which, like the two climbs we did yesterday, was used in last year’s Tour de France (and for this one, Act Two of the Etape du Tour). 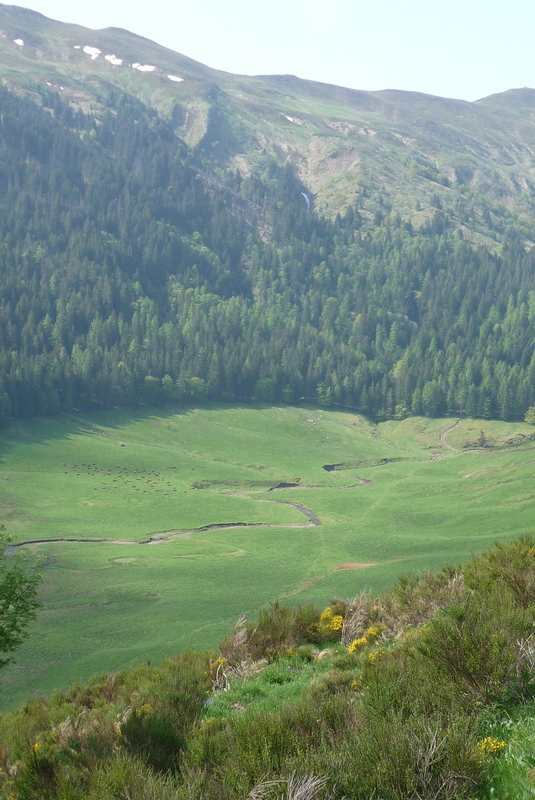 It is the highest road in the Massif Central mountain range, but at 1589m really isn’t ‘Pyrenean’ in height. On our first climb out of town John sped ahead to blaze the trail and it looks like Erik snuck by me somehow because I appear to be behind those two in this photo. The 3rd guy in the photo is ‘Francisco’ (I anoint him this because we don’t know his real name and he rides a F. Moser bike from the 70s), who adopted us at this very spot and stuck with us till the ride was done. As we rode off Francisco began checking us out, giving us the ‘up-down’, and pausing a bit too long for my liking on my triple chainring (if you ride you’ll know the immense embarrassment this can cause). I found myself doing the same, but concentrating more on his calves and seeing if he had a gut or not. I felt, especially given the weight of his antique vélo, I’d beat him to the top. Not for the last time, I was wrong. 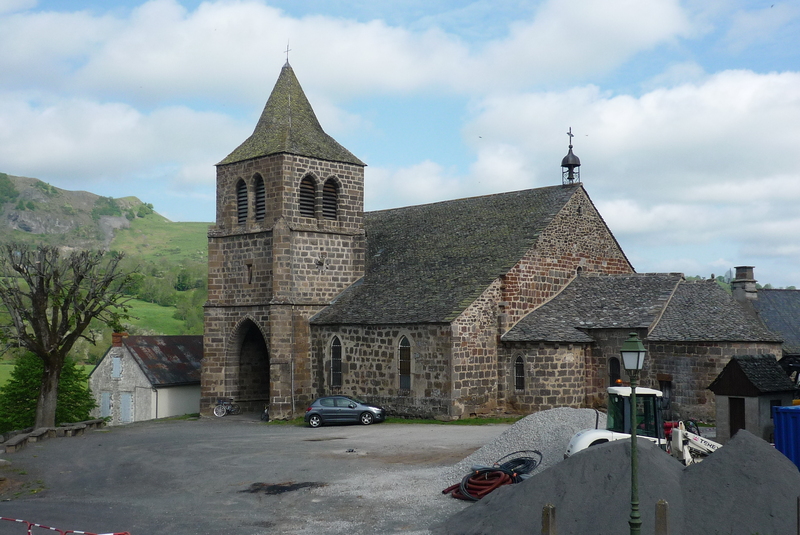 Imagine that, a church in France. Shortly after we got our first glimpse of our goal, but there was also plenty to keep our eyes wandering on the way. 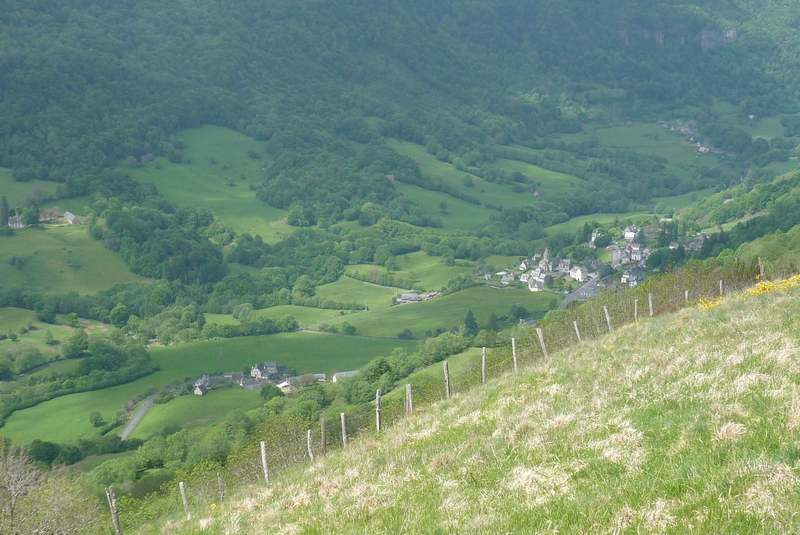 Really wonderful countryside in Cantal. And the promised bum shot. This all-black kit was not planned, but I think I’ll adopt it for the Etape du Tour this year. If I can’t win on ability maybe I can do it on intimidation! Anne and Erik, waiting for us to start the climb proper. We did, right after this, with a ramp of such extremeness that the field was quickly blown apart. With this guy and Francisco in the lead. John said that Francisco ‘man handled’ his bike up the mountain. He was a tough customer, Francisco. 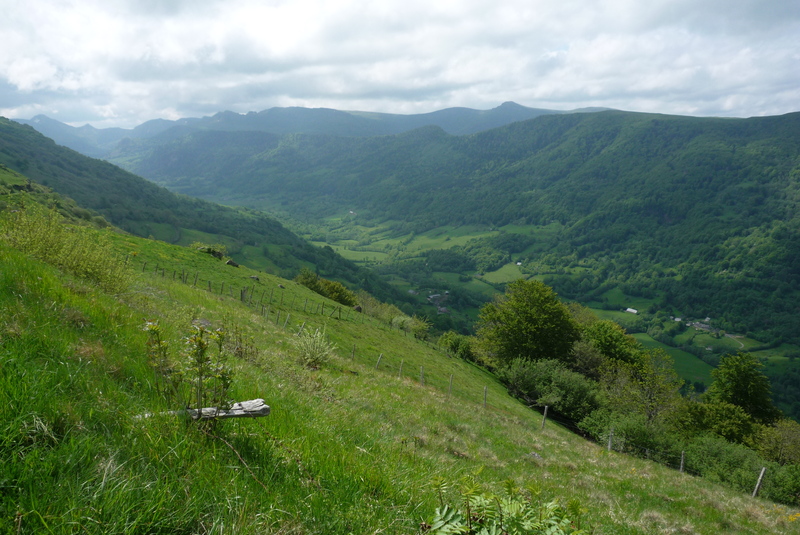 After that first ascent we descended a bit into a new, gorgeous valley. 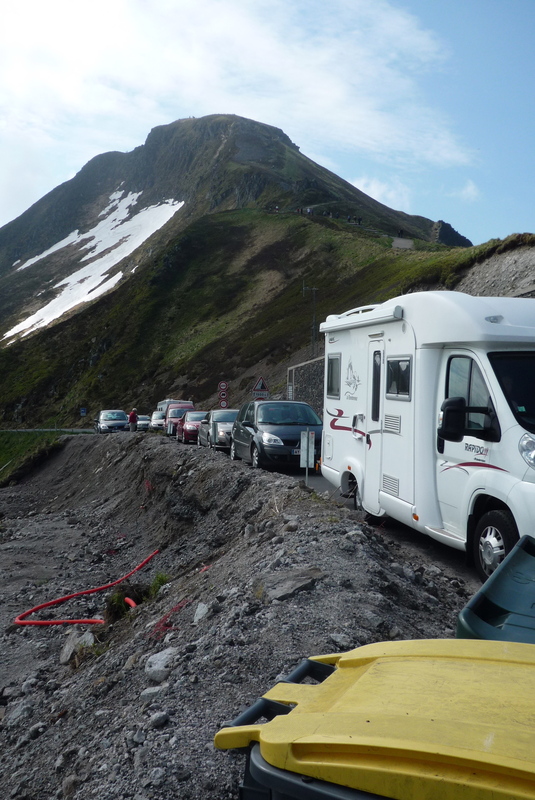 Then started up the last part of the climb to the pass. 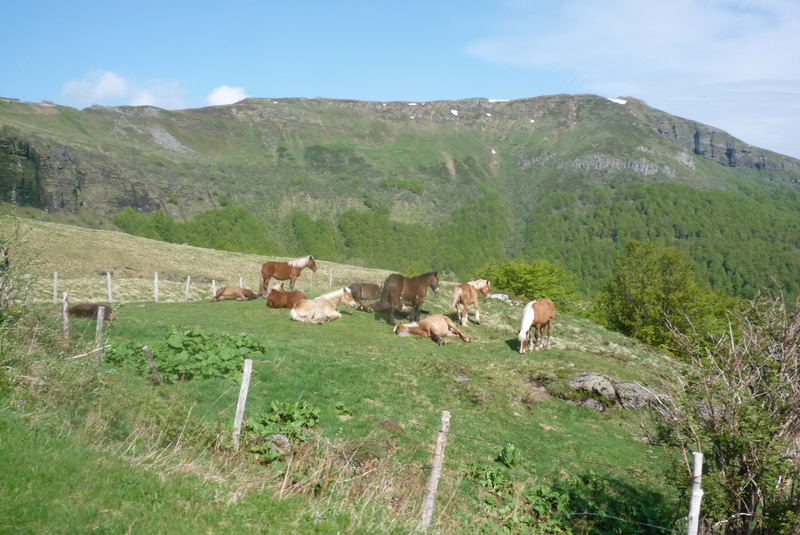 Look closely at these horses; there are a few that are totally crashed. I wished I could join them, but Erik was with me and it would have been rude. Here’s Erik, long after admitting defeat at least once then clawing his way back to my wheel, taking the lead on the steepest part of the climb. I’m not sure if he did this as part of his psychological cycling warfare, but he kept talking up these steep grades! OK, not full sentences maybe, but still enough to make me wish I had left him for those horses. I only remember two things he said, ‘snow!’ and ‘do you see Anne?’. I’m ashamed to say I didn’t care about either at 10%. Below is the gang at the top, talking about how fast and dangerous the upcoming descent was going to be. If we’d turned left we really would have been on a provably dangerous downhill, given that there was an awful crash on it just last year that took Alexandre Vinokourov out of the Tour de France, and probably cycling for good. There’s not much parking at top and this bottleneck is apparently a common sight. The descent was pretty steep and hairy in the beginning, but quickly turned into my favorite of the weekend. Unlike yesterday’s open-view slalom, this was more like a Return of the Jedi speeder bike battle. The road dove down through dense forest at awesome speeds, the turns usually not extreme enough to have to brake on. Very, very fun. 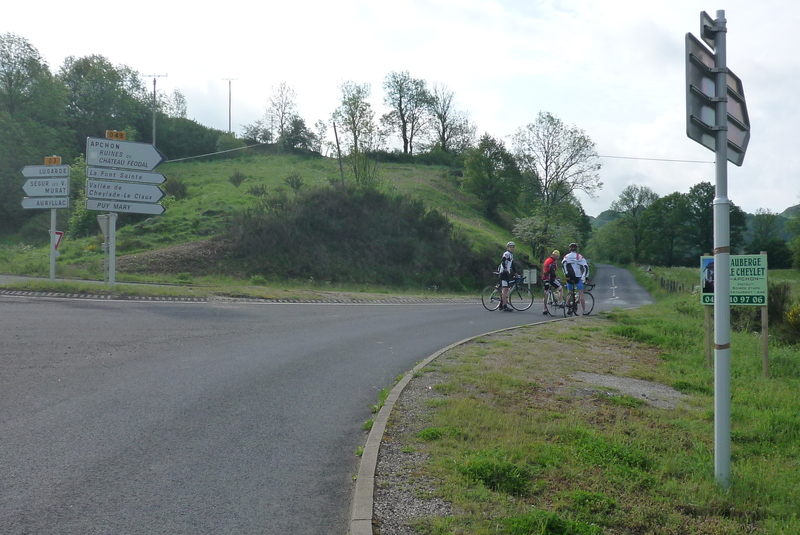 Then we had some nice, undulating terrain for a while till our last 5km climb, where I got my secret revenge on Francisco. This climb never went above 6% or 7% I’d guess and suited my temperament better because half way up I heard Francisco coughing and hacking (he was a noisy climber). Encouraged, I put on the gas a bit more then it got even better because John took the lead. I remained behind him, sucking his wheel the whole way to the top. Even silent-but-deadly Erik didn’t catch us (although that was really close)! 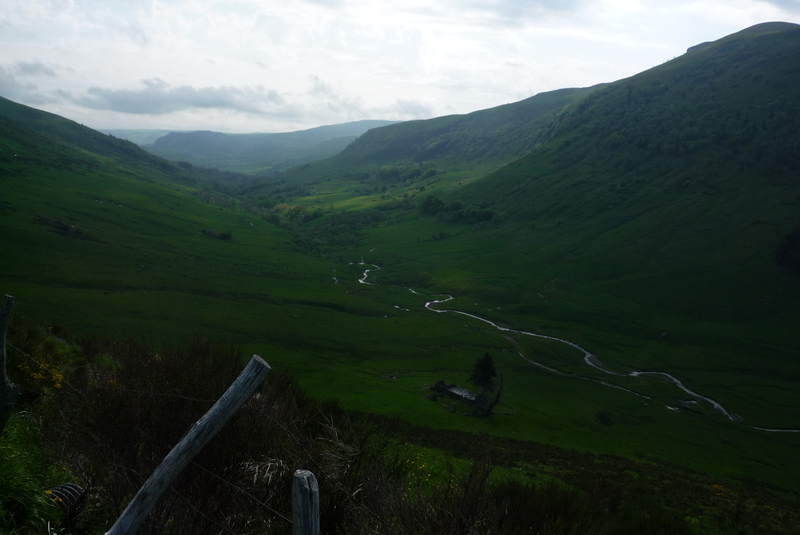 This is a shot from the top, looking back up yet another pretty valley. A village, far, far away. There was a tiny bit of climbing left to do, but for the most part our last hour or so was spent going down. Then it was back to the beginning and an end to a great training camp. 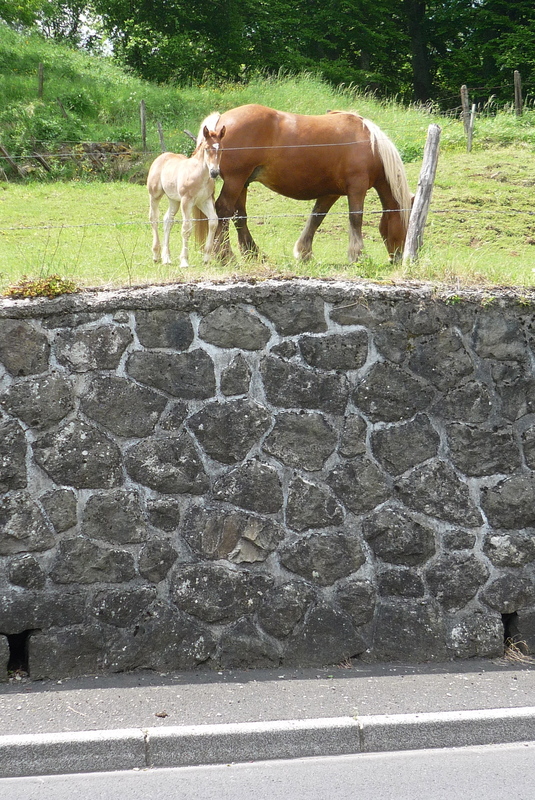 I’ll leave you with one of the many Bon Jovi (80s version, before the haircut) horses that inhabit Cantal. 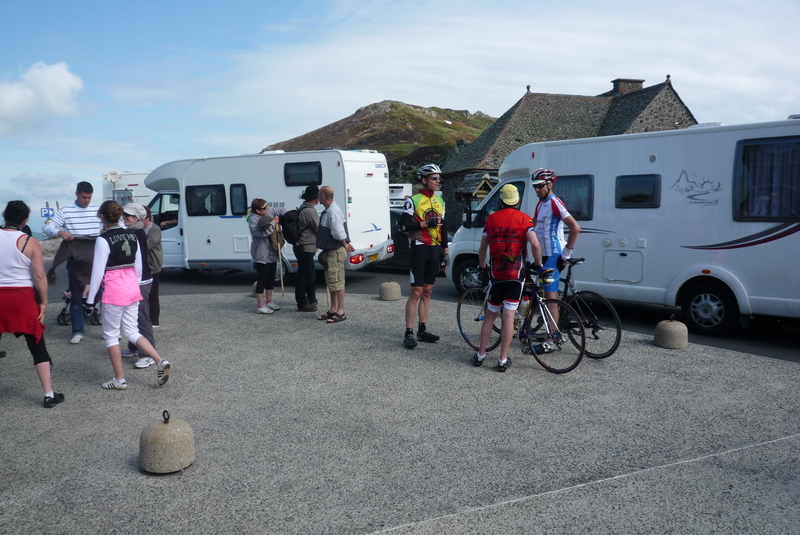 This entry was posted in Cycling, Mythic Rides / Climbs and tagged cantal cycling, col du pas de peyrol, puy mary. Bookmark the permalink. looks like great cycling good for you.. I feel bad, but he really was a vocal cyclist. nice pics. I hate stopping to take them. I appreciate the fact that you do! Thanks, Bill. Blogging is actually a good excuse for me to fall behind and ride at my own pace since I NEED photos. Great route, great pictures. Keep them coming. The season is upon us. I can nearly guarantee a steady flow! The countryside is deafening in summer at night. We’ve currently got nightingales, owls, frogs, the mysterious booping insect (!) and zillions of crickets and cicadas singing all night long! 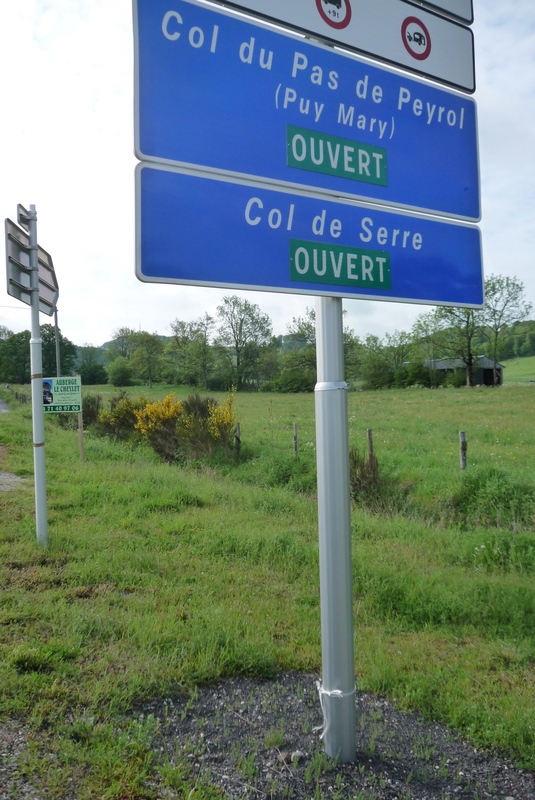 Noise pollution in the boonies of Creuse. Who would have guessed! Gotta give the frenchie some credit for hauling that steel over those passes. 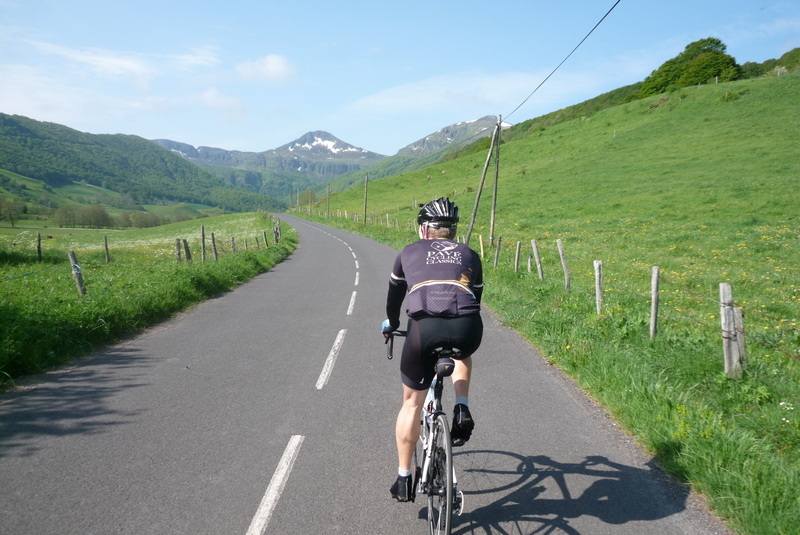 Did you hear his story about getting hypothermia while descending the Puy Mary in last years Etape, and eventually having to go to the medical tent? He deserves better — how about the “man of steel”. BTW, Denis is his real name. I think Francisco suits him better than Denis. 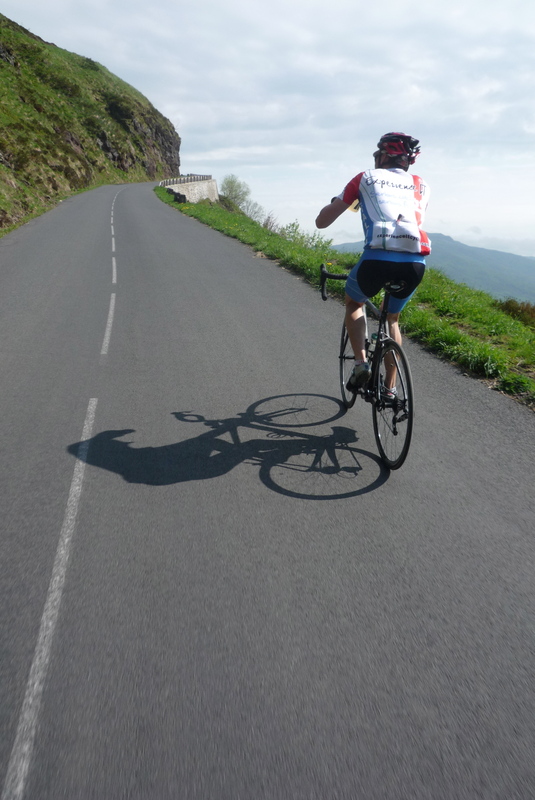 It’s more noble and befitting a guy who can carry an ancient steel frame up Puy Mary with you. And no, I didn’t hear (or understand) the part about the hypothermia, although I’m not surprised. They had appalling weather last year. OK, how about a compromise? ‘Francisco, Man of Steel’!